Tony Stark is kinda broke. New Captain America Sam Wilson and old Captain America Steve Rogers aren’t talking. Odin’s firstborn isn’t worthy to wield Mjolnir anymore. Marvel’s still going to have an Avengers team, of course, but it’s going to take some doing to have them assemble effectively. When we last saw two of the Avengers’ most important leaders before this summer’s Secret Wars event, Tony Stark and Steve Rogers were trying to kill each other. What’s more, the gigantic amalgam of the various Avengers teams were split into two factions. The Steve Rogers-led team was hunting Tony Stark and the other super-intelligent Illuminati to bring them to justice for doing really messed-up stuff across the multiverse while trying to save their reality. Earth’s Mightiest Heroes had self-destructed, due largely to their own internal conflicts. Thanks to leaks and previews from earlier this year, we already know the line-up of the team in All-New, All-Different Avengers. In issue #1—written by Mark Waid with art by Adam Kubert, Sonia Oback, and Cory Petit— readers get to see the first, uneasy steps of a present-day configuration of Marvel’s top-line super-team. The opening text clues readers in right away as to the state of disarray in Avengers-land. And that sentiment carries into the comic’s panels. The book opens with Captain America pulling off a flying rescue, only to have the ensuing photo op turn into yet another occasion for people to judge him. Tony Stark coincidentally happens to be close enough to deflect all the attention on Sam Wilson, and the two talk about how much things have changed. Sam answers Tony’s question above with stony silence. But, while the guy who used to be the Falcon and the man who was Captain America aren’t on speaking terms, Tony still talks to Steve Rogers. In this week’s Uncanny Avengers #2, there’s a brief convo between the two. That issue also includes another hint—via Avengers Unity Squad team member Johnny Storm—that the Reed Richards of the mainline Marvel reality might be dead. Right now, all of the Avengers teams are rebuilding and that makes sense from inside and outside the fiction. In the real world, the last iteration of the Avengers was largely steered by superstar writer Jonathan Hickman. His storylines culminated in the end of all existence and fed directly into Secret Wars, where an improbable salvation at the hands of Doctor Doom kept splinters of various realities alive. Marvel’s ongoing relaunch picks up eight months after Secret Wars ends—despite the fact that the miniseries still has a few issues to go—with the status quos of almost all their characters changing in major ways. Victor Von Doom, Wolverine and Doctor Strange all look and feel different. Peter Parker’s a multinational mogul now and, in ANAD Avengers #1, Tony Stark says the words “Parker Industries” with a bad taste in his mouth. He also lobs a little snark at Miles Morales, too, calling the kid who was Spider-Man in an alternate universe “Trademark Infringement Kid” when snatching him from freefall. Back when Marvel and DC were offering radically different brands of superhero action, Marvel billed itself as having more flawed and relatable superheroes in a milieu based on ‘the world outside your window.’ The best thing about All-New, All-Different Avengers #1 is how it seats an old-school classic Marvel feeling inside this tense moment of reconstruction. Marvel’s catching a lot of heat for its waves of changes since last year and, when Sam comments in the panels above about being under the microscope, you get the sense that Waid is invoking the drama that followed the character ever since he became the new Captain America. The Avengers has traditionally been Marvel’s premier super-team and now it’s connected to a major billion-dollar movie franchise. You can feel a subtext swirling around this newest series: it’s got to feature both the seasoned heroes who are touchstones for longtime fans and the newer characters that Marvel likely wants to launch into its expanding universe. (The inverse of that is the lack of an ongoing Fantastic Four comic, which many readers have been attributing the absence of Reed Richards to Marvel’s rivalry with Fox over the Fantastic Four film rights.) So, it makes sense to shine a spotlight on the new Nova and fan-favorite Ms. Marvel in a back-up story where he awkwardly hits on her. They’re even technically not on the team at the time of that story. But they will be, because they’re part of the future that Marvel’s building. 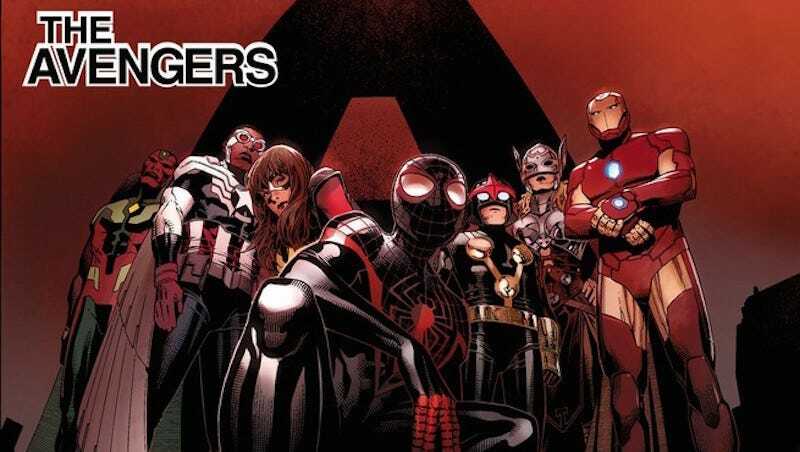 The ways that All-New, All-Different Avengers connects to the Marvel of old while representing the company’s ongoing evolution is going to be an intriguing spectacle as the series moves forward. As the comics versions of the Avengers franchise gets an infusion of new blood, it might just be that the younger characters help the older ones recapture the significance of what it means to be an Avenger.